A dartboard can elevate any room (or any man cave) to the next level. Imagine inviting your friends over for a few beers and a game of arrows, or releasing your tension by throwing the darts at the board. Before you go out and buy one, we should talk about your options. There are many dartboards on the market but have you thought about an electronic dartboard? They may seem like relics of the past, but modern electronic dartboards have improved technologically by leaps and bounds. The best ones can now keep score in a variety of games while maintaining the accuracy and feel of a traditional dartboard. We have sifted through the muck to bring you some of the best ones out there. Ready to go? Then, let’s get started with our number one choice. This is an excellent dartboard to liven any party. Get a large group of friends together and play one of 39 games. Listen to those poor players being heckled, and join in with the cheers when a 180 is thrown. We like this electronic dartboard for large groups and parties but, more than that, we love how easy it is to get playing. With the option to select games with a few handy shortcut buttons, you will be sipping your beer and throwing your darts in no time. This is an excellent dartboard for kids or adults starting out. Hang it up quickly, grab a beer and a few buddies, and get playing. This really is a nice dartboard. You will be the envy of your friends with this fantastic piece of technology. The dartboard can track up to eight players across 39 games and 179 variations. From classic dart games such as 301 and 501 to more obscure games like Football and Shove A Penny, you have enough here to keep the most avid dart fan entertained. The technology of the board itself has been improved. The holes are better designed to keep your darts in place and reduce bounce back. The segments between the holes are also smaller . This prevents the darts hitting sections where they will bounce when they should stick. The NylonTough segments will also hold up over time to keep you playing for years. One particularly interesting feature is the heckler options. With three levels, you can add some heckles to your games (when you or your friend’s play is poor) and some cheers (when you hit some top scores). We like that there is the option to track up to 16 players. If you are looking for the perfect dartboard for a party or a gathering, then look no further. With so many games at your disposal and options to cycle through, it can be easy to get lost in the multitude of variables. Viper has kept the user interface simple enough to be used by anyone. There are a few buttons to navigate but a few seconds to read them and you will see how obvious your choices are. After that, there will be no stopping you. One of the critical features of this dartboard, and one which we especially like, is the color scheme and display. The red, black, and silver are not representative of the traditional dartboard colors, but that is not a bad thing. This electronic dartboard has a futuristic look which will fit well into a modern man cave. The option to display the included darts (or your own personalized darts) is also a great idea. The LCD at the bottom of the unit finishes off the futuristic look. There is a lot of space for displaying stats but do not let that fool you. The display remains uncluttered (even when there are 16 players) and clear (you can see the numbers from as far back as your throw line). We like dartboards which come with (or in) a cabinet. You do not want your man cave to become too cluttered, especially if you have a lot hanging on your walls. This dartboard with cabinet will allow you to close up your dartboard after you are done playing or leave it open to showcase the silver, black, and red color scheme. This is another tremendous electronic dartboard for large groups. You have a number of games and varieties at your disposal, and enough power to track up to 16 players at one time. The LCD will show four scores at a time and in enough detail to be seen from behind the throw line. The board also features one of the most simple control interfaces which we have encountered. The buttons are simple to understand, and you will be able to pick up and play with this board without having to look up the instructions in the manual. We like this dartboard for large groups. This board with cabinet gives you a cheaper option than others on our list while still having a number of options to keep you occupied for hours. One of the top reasons for buying this dartboard is for the solo play. Yes, you can have up to 8 players playing at one time, but the cyber play feature is great for practicing. Instead of throwing your darts over and over in a non-game situation, you get the option to play against the dartboard computer on one of five difficulty levels. When your friends do come over, you will have the option of 38 games with 167 options. When you get playing, the LCD is easy to see from a distance and will show at a glance where each of the 8 players stands. The interface is also easy to use. There are no cluttered buttons, and space is handled well. 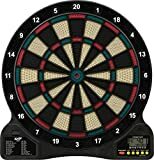 There are options to change the result of a dart should one bounce out and not be tracked by the board or eliminate a score if a variable was out of the computer’s control. The best way to get kids interested in a sport is to get them playing when they are young. This dartboard is perfect for that. The dartboard is easy to use, with darts sticking in the holes and holding firm, but also easy to remove when you have thrown your arrows. This dartboard may be simple, but you should not let that fool you. The board is great for kids but also makes a perfect addition to a man cave or office. You do not have to spend much money on this board, and you still get to have a ton of fun. The only downside is that you are going to have to track your own score. This is excellent news for children who need to work on their math skills and, let’s face it, adults too. As long as you know how to play a game, you can have as many friends around as you like and track your own scores. One of the features of this board is that you are not limited to 8 or 16 friends at one time. If you want to play a game with fifty people, you can do that. This board may not have all the bells and whistles of the other boards on the list, but it will still get the job done. It will also protect your furniture, walls, pets, and other humans. We like this dartboard for older children. It has enough features to keep teenagers busy and provides enough quality to keep them interested. This is a great starter electronic dartboard if you are not sure about how much you are going to play. There are 43 games to try, and you can play your own games without the scoring feature if you wish. 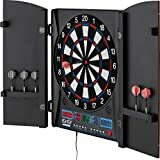 With the board being so inexpensive, it is a great present for children or a cheap addition to your man cave if you are not going to be playing a lot of darts. The soft-tip darts come with 24 extra tips. Over time, tips will break (either through wear or accidents). The included replacement tips will ensure that you are never left without enough darts to throw at the board. The segments are robust and forged from polymer compounds. The holes are tight enough to keep the darts lodged while the partitions are thin enough to prevent bounce outs. The same is true for the spider. It has been kept thin to minimize the risk of the darts bouncing from the board only to land on the floor. 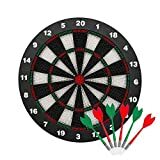 Can I use steel tipped darts on an electronic board? The short answer is no, you cannot use steel tipped darts on an electronic dart board. I've always loved to bowl, I've always loved to play (and watch) darts, I love picking up a ping pong paddle - I could go on. That's why I've created this site. I'm no professional but a good ol' down to earth guy, that wants to help others pick out the best products (it makes the games so much more fun) and get better at the same time (so you can beat your friends). GloverSports.com is a participant in the Amazon Services LLC Associates Program, an affiliate advertising program designed to provide a means for sites to earn advertising feed by advertising and linking to Amazon.com.